Summary First-gen Broadcom-based AC1750 class router with USB 2.0 port with unimpressive performance and other problems. 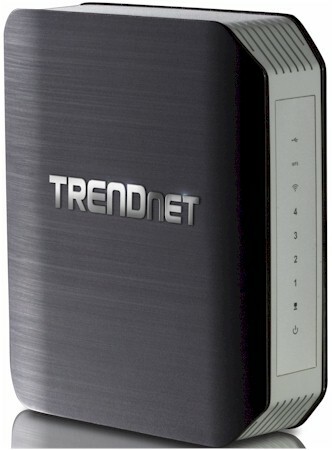 Apparently, it has been almost two years since I last reviewed a TRENDnet wireless router. The main reason for this is that TRENDnet has been a bit behind its competition lately with its wireless router introductions. Case in point is the TEW-812DRU that I'm reviewing today. While it's a top-of-line AC1750 class router, it's hitting market about a year behind its compeition. And to make matters worse, it's not a great performer. The 812DRU assumes the upright stance popular with many of today's router designs. The callout graphic below shows the indicators on the front and connectors on the rear. There are generous vent slots on the top and bottom of the router. But you might want to put taller feet on it to let it draw in more air for cooling. There are no slots for wall mounting. That single USB port is 2.0, not 3.0. But I don't think USB 3.0 would have helped much for file copy performance, as we'll see in a bit. TRENDnet requested a 180 day delay in the FCC's posting of the 812DRU's internal photos. So after testing was done, I opened it up and took my own. The photo below shows the key components all covered with ceramic heat spreaders that are secured with metal brackets. The bracket on the 2.4 GHz radio at photo lower right was too close for my comfort to the mini PCIe module's mini RF connectors, especially since there was no insulating tape on the bottom of the bracket. Still, the bracket did not touch the connectors. Removing the heat spreaders provided a good look at all the main components, which are summarized in Table 1. I assume the metalized tape on the board is for RF shielding purposes, since it isn't coupled to any surfaces that would allow it to serve as a heatsink. The table shows that the design sticks with the key components used in all first-generation draft 11ac routers. The table includes the Buffalo WZR-D1800H—the first draft 11ac router I tested—component list, to illustrate the point. Comparing the Buffalo internal photo below with the TRENDnet's above, I think both use the same mini PCIe 2.4 GHz radio module. TRENDnet, however, opted to integrate its 5 GHz radio directly onto the main board.